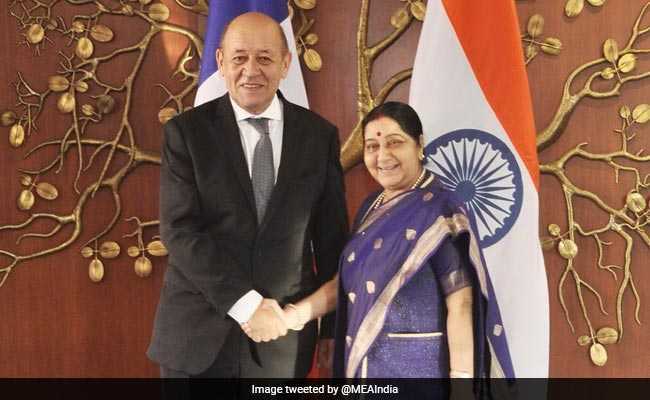 French Foreign Minister Jean Yves Le Drian said his discussion with Sushma Swaraj was characterized by great "convergence of views and shared ambition". External Affairs minister Sushma Swaraj with her French counterpart Jean Yves Le Drian. External Affairs Minister Sushma Swaraj and her French counterpart Jean Yves Le Drian held talks on deepening bilateral strategic partnership between the two countries through cooperation in defence, space and civil nuclear energy sectors. "We had very fruitful talks. We closely looked at all the aspects of our mutual ties. We are taking our cooperation forward in the Indo-Pacific region, which will not only benefit these two countries but also other countries in the region," Ms Swaraj said. She also reiterated the resolve of the two nations to jointly fight terrorism. "We both are also working in strengthening our ties in space sector. We both are also leading fight against climate change," she said. The two ministers also reviewed the status of the European Pressurized Reactor (EPR) project in Jaitapur, Maharashtra and adopted an action plan for its building. "Six EPRs account for a total capacity of almost 10 GW, which is a significant contribution to India's aim of producing 40 per cent of its electricity from non-fossil fuels by 2030, in keeping with its commitments made ahead of the Paris Climate Conference," he said. Mr Le Drian added that the discussion he had with Ms Swaraj was "characterised as always by a great convergence of views and shared ambition". "It is not by chance that France and India are celebrating the 20th anniversary of their strategic partnership this year. It is because we attach the same importance to multilateralism, respect for the rule of law, the same ambition to usher in a just and sustainable world," he said.